We didn’t know what was in it, and we didn’t read it – But we rammed it through at all costs against the will of the people. 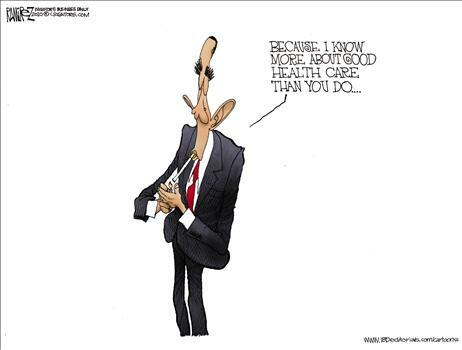 Obama Care in a nutshell. And these people want to take over and control more off our society and economy. Since the passage of ObamaCare, several major U.S. companies — so far, they include AT&T, Verizon, Caterpillar, Deere, Valero Energy, AK Steel and 3M — have announced that they expect the law to cost them billions of dollars in higher health care expenses. This has prompted an angry Rep. Henry Waxman, chairman of the House Committee on Energy and Commerce and one of many Democrats who swore up and down that the measure would actually cut costs, to summon some of the executives to Capitol Hill to defend their assessment. Rep. Waxman is also demanding that the executives give lawmakers internal company documents related to health care finances, a move one committee Republican describes to Byron York of the Washington Examiner as ”an attempt to intimidate and silence opponents” of ObamaCare. Perhaps these Democrats really are surprised ­– perhaps (as Republicans consistently warned) they never actually read and comprehended what was in their nearly 3,000-page social engineering experiment. Nor is this just coming from Republicans. One Democratic staffer affiliated with the Waxman committee told the magazine that neither Rep. Waxman nor Rep. Bart Stupak, chairman of the Oversight and Investigations panel, had anything more than a cursory understanding of how the many sections of the bill would impact business or even individuals before they voted on the legislation. Democrats blame a vast CEO conspiracy. That’s how the AFL-CIO put it in a December 10 letter. The Communications Workers of America and the International Brotherhood of Electrical Workers—also known as the AT&T and Verizon workforce—were opposed too. So much for White House claims that reporting these facts is partisan. As for whether this change is better tax policy, the new health-care bill creates a similar $5 billion fund that will subsidize health costs for early retirees between the ages of 55 and 64. These payments won’t be subject to taxation, and companies will likely be able to deduct the full cost of such coverage. (The language is vague and some experts disagree.) The Democrats now feigning tax outrage—but who are really outraged by political appearances—didn’t think twice about writing the same loophole back into the tax code. This new reinsurance program was a priority of the United Auto Workers. The deeper concern—apart from imposing senseless business losses in a still-uncertain economy—is that companies will start terminating private retiree coverage, which in turn will boost government costs. The Employee Benefit Research Institute calculates that the 28% subsidy on average will run taxpayers $665 in 2011 and that the tax dispensation is worth $233. The same plan in Medicare costs $1,209. Given that Congress has already committed the original sin of creating a drug entitlement that crowds out private coverage, $233 in corporate tax breaks to avoid spending $1,209 seems like a deal. If one out of four retirees is now moved into Medicare, the public fisc will take on huge new liabilities. Perhaps Mr. Waxman should move his hearing to the Syracuse Carrier Dome. The Towers Watson consulting firm estimates that the total writeoffs will be as much as $14 billion, and the 3,500 businesses that offer retiree drug benefits are by law required to report and expense their losses this quarter or next. But ‘twas a famous victory, ObamaCare. This entry was posted on 31 mars, 2010 at 2:12 e m and is filed under USA. You can follow any responses to this entry through the RSS 2.0 feed. You can leave a response, or trackback from your own site.